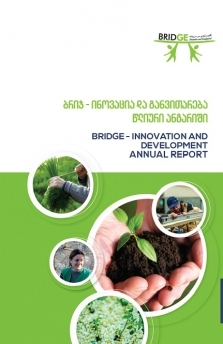 BRIDGE - Innovation and Development (BRIDGE) is a young and fast growing non-governmental organization operating in Georgia, driven by its vision of Georgia free of poverty and suffering. BRIDGE Founded in 2015, is a spin-off organization of Oxfam in Georgia, with a commitment to sustain grassroot connections and partnerships and supporting agriculture and rural development, advancing gender equality and women’s rights, with a focus on rural women and youth and building resilient communities to reduce poverty and stimulate economic growth. 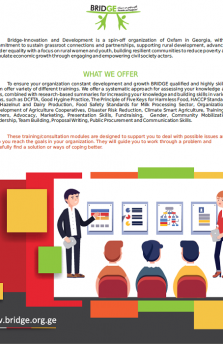 BRIDGE draws on practical skills and experience in advocacy and policy oversight areas, and in campaigns and influencing for pro-poor and gender sensitive policies. These approaches include a strong emphasis on the bottom-up principle of policy development through capacitating, engaging and empowering local civil society actors. On March 20, 2019 members of Bridge- Innovation and Development (BRIDGE) started mobilization activities in two villages of Tsalka municipality. Meeting were attended by the head of municipalities and local population. Representatives from Bridge shared information to the attendees about the construction of two workshops, to produce biological bricks in Tsalka municipality planned in terms of Japan embassy green policy initiated the project. 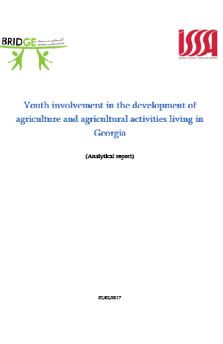 The project was developed by experts of BRIDGE and this is going to substitute usage of firewood with biologically clean breaks and will create a good precedent for replication, to potentially avoid deforestation in Georgia. It will also cost about twice less than firewood, which is very important for poverty alleviation among ecological migrants, residing in Tsalka. The Human Security Grant Assistance for Grassroots Projects (GGP) assists to relatively small projects and aims at improvement of human security in Georgia. It applies to projects in the field of sustainable agriculture, environment protection, poverty alleviation, public health, education, social protection etc.